Steelers President Art Rooney II talked with the media today, and via tweets we share what he had to say on various issues, including replay and the future of safety Troy Polamalu. Rooney doesn't like any of the PAT proposals either. Prefers Mike Tomlin's suggestion — move ball to 1 to encourgae more 2-pt conversions. Rooney II: 'Increasing the number of plays to be replays is not the direction we want to go." Asked if Troy coming back an option, Art Rooney said he had no update. Team prez Art Rooney II said not expecting Steelers to have "lot more activity" in free agency. But added, "We certainly continue to look." 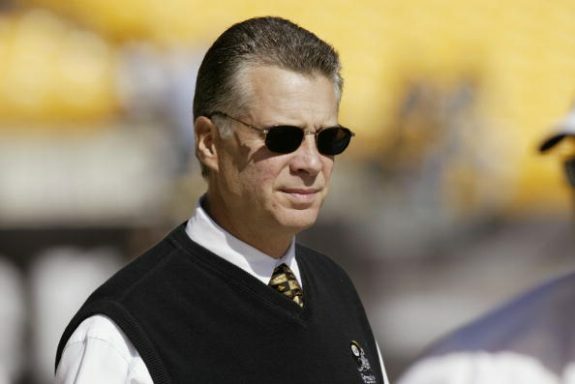 Art Rooney II: "We have no update on Troy." Rooney said scheduling of postseason games is barrier to expanding the playoffs. He said expansion would only be 1 more team per conference. Be the first to comment on "Rooney II Talks To Media On Issues, Replay, Polamalu"